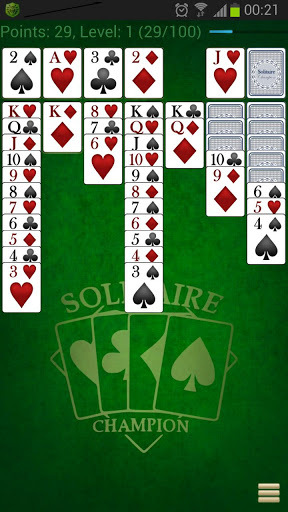 Solitaire Champion HD is an Android App developed byCrimson Pine Solitaire Games. There is no real shortage of gambling and card games on the Google Play store so for an app to stand out it has to be a pleasure to look at, easy to use and engaging to play. So often Android gamers are let down in one or all of these departments. So how does Solitaire Champion HD perform? Solitaire Champion HD: Decked out graphics! When you launch the game for the first time, you are met with a very nice ‘lobby room’ inviting you to play your first game. You also have some buttons along the bottom to view your statistics, change game settings, connect with Facebook and earn/spend your Pocket Change. Of course though, you will be looking to hit the big play button that dominates the screen. Solitaire Champion HD comes with Klondike Solitaire pre-loaded but you also have the choice to install Yukon, FreeCell and Spiderette Solitaire. 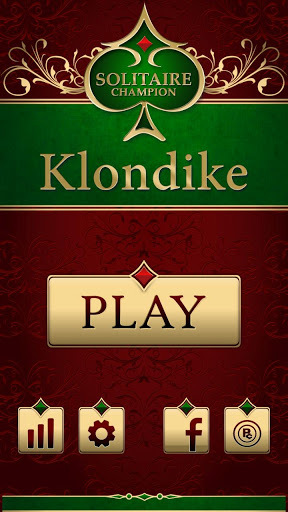 I’m a classic kind of guy so I went with Klondike, once in the game the story pretty much writes itself. With the cards laid out it is your job to put them in the suits they belong. Thankfully though, if you get stuck, you have the opportunity in the settings menu to ‘Reshuffle’ the cards. You only have 1 reshuffle to begin with so use it wisely. As the game progresses you get more reshuffles to help you finish off your game and earn as many points as possible. Throughout the game you will earn Pocket Coins for in game events like ‘Winning your first hand’. These can then be redeemed to purchase things like Games, Books, Movies and other items. This is a great feature that gives you something to play for without getting close to the problems that can arise from online gambling apps. Overall the game has excellent facilities to make game play addictive, easy and engaging. For me looks are everything, one element that holds back a large number of apps is their poor graphical quality. Solitaire Champion HD is beautiful and the HD is not just in the title as a gimmick. The graphics are crisp and eye-catching and when you move cards the animations are fun and responsive. The overall user interface is very well designed, the screen only has what you need and this lets you focus on the gameplay; which is perfect for this game. Of course there are ads and these are annoying, pixelated and ugly looking things but after noticing them once or twice, they never got in the way and I soon forgot they were there. In summary, this is a great app for those who are after a well designed HD card game experience. The app takes it to the next level with Pocket Change, this is a great way for you to earn bonuses that you can spoil yourself with. The measure of a good app for me is whether or not I keep it on my device after renewing it, and I can tell you this is staying on for quite some time. Solitaire Champion HD is available from the Google Play Store and works on Android versions 2.1 and up.